By now, you must be tired of hearing how easy it is to prepare Italian food at home and you’re probably ready to drown me in extra virgin olive oil (that actually wouldn’t be a bad way to go as long as I had some good bread with me). However, I woke up this morning with a cold chill running through me because I’ve neglected to share with our readers one of the simplest recipes on the planet; namely, easy roasted chicken. 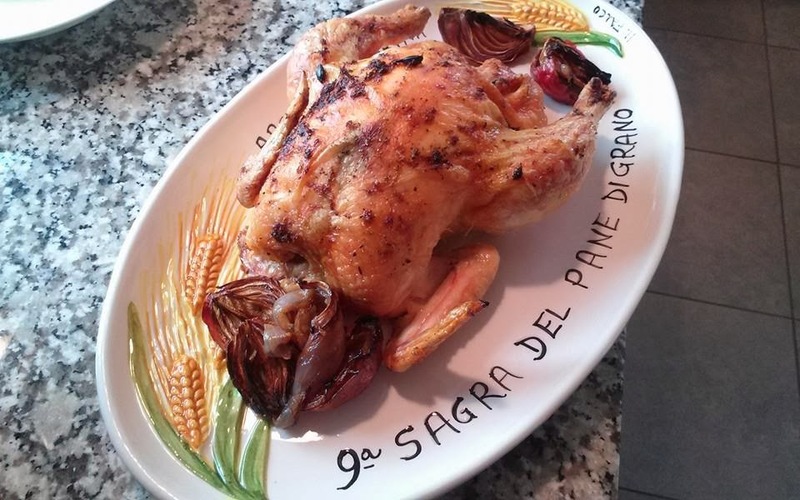 Yes, I’ve shared a variant of the roasted chicken which requires a whole butterflied chicken and a barbecue, but the following version requires very little beyond an oven and a quality bird. So, the next time you hear the phrase cooking at home is hard or I don’t have the time to prepare a great meal just utter, “ROASTED CHICKEN” – say it slowly for dramatic effect. Oh, you’re probably thinking roast chicken isn’t a meal; ok, make some white or brown nice (with olive oil and grated cheese), a simple salad with a homemade dressing, good bread, and a $10 bottle of wine. Heat your oven to 425 degrees Fahrenheit and cover a whole 3-4 pound chicken chicken with liberal amounts of kosher salt and freshly ground black pepper. Place the chicken in a cast iron or roasting pan (breast side up). If you have a lemon and parsley, stick half the lemon and some whole parsley in the cavity of the chicken. Place the chicken in the oven for 1 - 1.5 hours depending on the size of your bird and thereafter remove and let sit for 15 minutes. That's it, you're done. You could add other herbs like thyme or rosemary or even crushed fennel seed. okay … this looks molto delizioso. can it really be this easy?